GST Council meeting happened on 24th February 2019 (Sunday). The 33rd GST Council meeting came to an end after heavy theatrics. The Council was initially supposed to meet on the 20th Feb 2019 via video conferencing but was later deferred to 24th Feb 2019 to meet at Delhi, post the refusal by some state FMs. With the general elections around the corner, it was highly speculated that the meeting would be politically driven. The sops announced by the GST Council will boost the real estate selling henceforth and monitor one of the most unregulated sectors in India, by ensuring that the rate cut benefits are passed on to the neo and middle-class home buyers. The agenda of the 33rd GST Council meeting covered ‘Under-Construction Housing’ sector and ‘Private Lottery Distribution’. The announcements on rate cuts for under-construction houses will be notified on 10th March 2019 after the GST Council passes the draft notifications and will be made applicable from 1st April 2019. 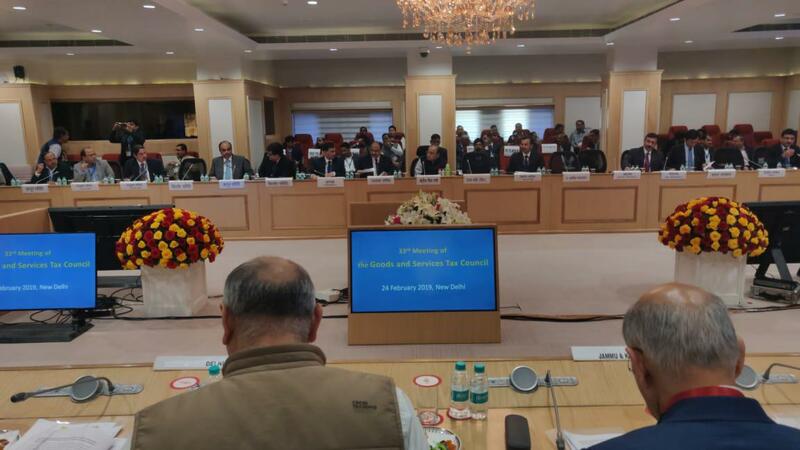 33rd GST Council Meeting started at 2 P.M on 24th Feb 2019 at New Delhi. The 33rd GST Council meeting was to be held on 20th February 2019 via Video Conferencing. However, it was adjourned to 24th February 2019(Sunday), with no conclusive decision taken. The GST Council met on 20th February 2019 for a brief time to start with the discussions on real estate. However, considering that a meet via video conferencing cannot support the detailed discussion on issue crucial such as real estate taxation, the meeting was adjourned. No discussions were initiated on Lottery. The GST Council also extended the GSTR-3B Due date for the month of January 2019 by two days to 22nd February 2019. It is chaired by the Finance Minister Arun Jaitley. This will be the 33rd GST Council meeting and the first one after the Interim Budget 2019. The previous meeting- 32nd GST Council meet happened at Delhi on 10th January 2019 and chaired by the FM Arun Jaitley. Catch all the highlights of the 32nd GST council meeting that lays down the base for this GST council meeting. GST Rate for affordable housing slashed to 1% without the benefit of the Input tax credit (ITC) as against the earlier rate of 8%. However, the earlier proposal had pointed out that the rate will be slashed down to 3% without the ITC benefit. In case of Non-metro cities: Flats with a value up to Rs.45 lakhs with the carpet area of up to 90 sq.m. GST rate for non-affordable housing reduced to 5% without ITC from the existing rate of 12%. On or before 10th March 2019, all the changes will be drafted in a circular by the law and fitment committee and will be presented before the GST Council as recommendations. The Notifications will be out before the public soon after it is passed by the GST Council and will be made applicable from 1st April 2019. This call was taken to sensitively address the transitional issues likely to be faced by many builders who have ongoing projects before the date of implementation of the new rates. GST exemption proposed on Transfer Development Rights (TDR)/ Joint Development Agreement(JDA), long term lease (premium), FSI- Press release states that an Intermediate tax on development rights such as the above mentioned will be exempt from GST for such residential properties on which GST is payable. No rate cuts were discussed for Cement, which is currently being charged a GST at the rate of 28%. To decide whether or not to bring the supply of residential properties under the Composition scheme as discussed at the previous GST Council meeting. A group of ministers(GoM) headed by Gujarat CM Nitin Patel has placed the final report before the council. To deliberate whether or not the tax rates on Cement must be reduced from 28% and 18%, as suggested by the Committee. In one of the previous meetings held in December 2018, the finance minister Arun Jaitley had ruled out any possibility of further rate cuts, stating this would impact GST revenue collection. He replied that the cut would happen once the revenue flow was found satisfactory. Duty drawback-like scheme under GST to be introduced for exporters. Proposal placed before the council to reduce the rates for under-construction homes. It has been proposed to reduce to 5% from 12% and to 3% from 8% in the case of affordable housing. In both cases, the Input Tax Credit (ITC) will not be available. One of the primary issues that builders currently face is that the balance ITC remains unutilised due to the high tax rate on cement and other raw materials. ITC is more when compared to tax liability. Hence, there attracts a need for applying GST refund -a process which is yet to stabilise. One of the much-asked demands of the industry is to cut the GST Rate charged the sale of Cement. Cement is the basic raw material in the construction sector and a necessity for building homes. It is supposedly positioned at the 5th- to be an essential material accounting for the construction costs in India. Therefore, the issue on taxability of Cement garnered GST Council’s attention after multiple requests of the Cement Manufacturers Association India. Compensation for taxes other than the basic customs duty (BCD) is not given to the exporters under the GST regime. Accordingly, it affects their competitiveness. GST Officials involved in the exercise confirmed that the duty drawback scheme is being prepared after a requisition letter from the Directorate General of Foreign Trade (DGFT) to the Central Board of Indirect Taxes & Customs seeking such relief.